This article is available as a Jupyter Notebook on Google’s Colaboratory (open in playground mode to run and edit) and at the Machine Learning Github repository for the Dunder Data Organization. This article is aimed at those that use Scikit-Learn as their machine learning library but depend on Pandas as their data exploratory and preparation tool. We explore the new ColumnTransformer estimator, which allows us to apply separate transformations to different subsets of your data in parallel before concatenating the results together. A major pain point for users (and in my opinion the worst part of Scikit-Learn) was preparing a pandas DataFrame with string values in its columns. This process should become much more standardized. The OneHotEncoder estimator was given a nice upgrade to encode columns with string values. We will build a custom estimator that does all the “basic” transformations on a DataFrame instead of relying on the built-in Scikit-Learn tools. This will also transform the data with a couple different features not present within Scikit-Learn. Finally, we explore binning numeric columns with the new KBinsDiscretizer estimator. This tutorial is provided as a preview of things to come. The final version 0.20 has not been released. It is very likely that this tutorial will be updated at a future date to reflect any changes. For those that use Pandas as their exploratory and preparation tool before moving to Scikit-Learn for machine learning, you are likely familiar with the non-standard process of handling columns containing string columns. Scikit-Learn’s machine learning models require the input to be a two-dimensional data structure of numeric values. No string values are allowed. Scikit-Learn never provided a canonical way to handle columns of strings, a very common occurrence in data science. This lead to numerous tutorials all handling string columns in their own way. Some solutions included turning to Pandas get_dummies function. Some used Scikit-Learn’sLabelBinarizer which does one-hot encoding but was designed for labels (the target variable) and not for the input. Others created their own custom estimators. Even entire packages such as sklearn-pandas were built to support this trouble spot. This lack of standardization made for a painful experience for those wanting to build machine learning models with string columns. Furthermore, there was poor support for making transformations to specific columns and not to the entire dataset. For instance, it’s very common to standardize continuous features but not categorical features. This will now become much easier. With the upgrade to version 0.20, many workflows from Pandas to Scikit-Learn should start looking similar. The ColumnTransformer estimator applies a transformation to a specific subset of columns of your Pandas DataFrame (or array). The OneHotEncoder estimator is not new but has been upgraded to encode string columns. Before, it only encoded columns containing numeric categorical data. Let’s see how these new additions work to handle string columns in a Pandas DataFrame. One of Kaggle’s beginning machine learning competitions is the Housing Prices: Advanced Regression Techniques. The goal is to predict housing prices given about 80 features. There is a mix of continuous and categorical columns. You can download the data from the website or use their command line tool (which is very nice). Let’s read in our DataFrame and output the first few rows. The target variable is SalePrice which we remove and assign as an array to its own variable. We will use it later when we do machine learning. To start off, let’s encode a single string column, HouseStyle, which has values for the exterior of the house. Let’s output the unique counts of each string value. We have 8 unique values in this column. The Scikit-Learn API is consistent for all estimators and uses a three-step process to fit (train) the data. Fit the estimator to the data. Possibly transform the data to its new space if need be. Below, we import OneHotEncoder, instantiate it and ensure that we get a dense (and not sparse) array returned, and then encode our single column with the fit_transform method. As expected, it has encoded each unique value as its own binary column. We have a NumPy array. Where are the column names? Notice that our output is a NumPy array and not a Pandas DataFrame. Scikit-Learn was not originally built to be directly integrated with Pandas. All Pandas objects are converted to NumPy arrays internally and NumPy arrays are always returned after a transformation. We can still get our column name from the OneHotEncoder object through its get_feature_names method. It’s good to verify that our estimator is working properly. Let’s look at the first row of encoded data. This encodes the 6th value in the array as 1. Let’s use boolean indexing to reveal the feature name. Now, let’s verify that the first value in our original DataFrame column is the same. Just like most transformer objects, there is an inverse_transform method that will get you back your original data. Here we must wrap row0 in a list to make it a 2D array. We can verify all values by inverting the entire transformed array. Whatever transformation we do to our training set, we must apply to our test set. Let’s read in the test set and get the same column and apply our transformation. We should again get 8 columns and we do. This example works nicely, but there are multiple cases where we will run into problems. Let’s examine them now. What happens if we have a home with a house style that is unique to just the test set? Say something like 3Story. Let's change the first value of the house styles and see what the default is from Scikit-Learn. By default, our encoder will produce an error. This is likely what we want as we need to know if there are unique strings in the test set. If you do have this problem then there could be something much deeper that needs investigating. For now, we will ignore the problem and encode this row as all 0’s by setting the handle_unknown parameter to 'ignore' upon instantiation. Let’s verify that the first row is all 0's. If you have missing values in your test set (NaN or None), then these will be ignored as long as handle_unknown is set to 'ignore'. Let’s put some missing values in the first couple elements of our test set. Missing values in the training set are more of an issue. As of now, the OneHotEncoder estimator cannot fit with missing values. It would be nice if there was an option to ignore them like what happens when transforming the test set above. As of now, this doesn’t exist and we must impute it. For now, we must impute the missing values. The old Imputer from the preprocessing module got deprecated. A new module, impute, was formed in its place, with a new estimator SimpleImputer and a new strategy, 'constant'. By default, using this strategy will fill missing values with the string ‘missing_value’. We can choose what to set it with the fill_value parameter. From here we can encode as we did previously. Notice, that we now have an extra column and and an extra feature name. For all estimators, the fit_transform method will first call the fit method and then call the transform method. The fit method finds the key properties that will be used during the transformation. For instance, with the SimpleImputer, if the strategy were ‘mean’, then it would find the mean of each column during the fit method. It would store this mean for every column. When transform is called, it uses this stored mean of every column to fill in the missing values and returns the transformed array. The OneHotEncoder works analogously. During the fit method, it finds all the unique values for each column and again stores this. When transform is called, it uses these stored unique values to produce the binary array. Scikit-Learn provides a Pipeline estimator that takes a list of transformations and applies them in succession. You can also run a machine learning model as the final estimator. Here we simply impute and encode. Each step is a two-item tuple consisting of a string that labels the step and the instantiated estimator. The output of the previous step is the input to the next step. The test set is easily transformed through each step of the pipeline by simply passing it to the transform method. Why just the transform method for the test set? When transforming the test set, it's important to just call the transform method and not fit_transform. When we ran fit_transform on the training set, Scikit-Learn found all the necessary information it needed in order to transform any other dataset containing the same column names. Encoding multiple string columns is not a problem. Select the columns you want and then pass the new DataFrame through the same pipeline again. It is possible to retrieve each individual transformer within the pipeline through its name from the named_steps dictionary atribute. In this instance, we get the one-hot encoder so that we can output the feature names. The brand new ColumnTransformer (part of the new compose module) allows you to choose which columns get which transformations. Categorical columns will almost always need separate transformations than continuous columns. The ColumnTransformer is currently experimental, meaning that its functionality can change in the future. The columns actually don’t have to be column names. Instead, you can use the integer indexes of the columns, a boolean array, or even a function (which accepts the entire DataFrame as the argument and must return a selection of columns). You can also use NumPy arrays with the ColumnTransformer, but this tutorial is focused on the integration of Pandas so we will stick with just using DataFrames. We can even pass a pipeline of many transformations to the column transformer, which is what we do here because we have multiple transformations on our string columns. Below, we reproduce the above imputation and encoding using the ColumnTransformer. Notice that the pipeline is the exact same as above, just with cat appended to each variable name. We will add a different pipeline for the numeric columns in an upcoming section. The ColumnTransformer instance selects the columns we want to use, so we simply pass the entire DataFrame to the fit_transform method. The desired columns will be selected for us. We can now transform our test set in the same manner. We have to do a little digging to get the feature names. All the transformers are stored in the named_transformers_ dictionary attribute. We then use the names, the first item from the three-item tuple to select the specific transformer. Below, we select our transformer (there is only one here — a pipeline named ‘cat’). Then from this pipeline we select the one-hot encoder object and finally get the feature names. The numeric columns will need a different set of transformations. Instead of imputing missing values with a constant, the median or mean is often chosen. And instead of encoding the values, we usually standardize them by subtracting the mean of each column and dividing by the standard deviation. This helps many models like ridge regression produce a better fit. Instead of selecting just one or two columns by hand as we did above with the string columns, we can select all of the numeric columns. We do this by first finding the data type of each column with the dtypes attribute and then testing whether the kind of each dtype is 'O'. The dtypes attribute returns a Series of NumPy dtype objects. Each of these has a kind attribute that is a single character. We can use this to find the numeric or string columns. Pandas stores all of its string columns as object which have a kind equal to ‘O’. See the NumPy docs for more on the kind attribute. Get the kinds, a one character string representing the dtype. Assume all numeric columns are non-object. We can also get the categorical columns in this manner. Once we have our numeric column names, we can use the ColumnTransformer again. We can apply separate transformations to each section of our DataFrame with ColumnTransformer. We will use every single column in this example. We then create a separate pipeline for both categorical and numerical columns and then use the ColumnTransformer to independently transform them. These two transformations happen in parallel. The results of each are then concatenated together. The whole point of this exercise is to set up our data so that we can do machine learning. We can create one final pipeline and add a machine learning model as the final estimator. The first step in the pipeline will be the entire transformation we just did above. We assigned y way back at the top of the tutorial as the SalePrice. Here, we will just use thefit method instead of fit_transform since our final step is a machine learning model and does no transformations. Of course, scoring ourselves on the training set is not useful. Let’s do some K-fold cross-validation to get an idea of how well we would do with unseen data. We set a random state so that the splits will be the same throughout the rest of the tutorial. Grid searching in Scikit-Learn requires us to pass a dictionary of parameter names mapped to possible values. When using a pipeline, we must use the name of the step followed by a double-underscore and then the parameter name. If there are multiple layers to your pipeline, as we have here, we must continue using double-underscores to move up a level until we reach the estimator whose parameters we would like to optimize. All the results of the grid search are stored in the cv_results_ attribute. This is a dictionary that can get converted to a Pandas DataFrame for a nice display and it provides a structure that is much easier to manually scan. There are a few limitations to the above workflow. For instance, it would be nice if the OneHotEncoder gave you the option of ignoring missing values during the fit method. It could simply encode missing values as a row of all zeros. Currently, it forces us to fill the missing values with some string and then encodes this string as a separate column. Also, string columns that appear only a few times during the training set may not be reliable predictors in the test set. We may want to encode those as if they were missing as well. Scikit-Learn provides some help within its documentation on writing your own estimator class. The BaseEstimator class found within the base module provides the get_params and set_params methods for you. The set_params method is necessary when doing a grid search. You can write your own or inherit from the BaseEstimator. There is also a TransformerMixin but it just writes the fit_transform method for you. We do this in one line of code below, so we don’t inherit from it. It is called ‘basic’ because, these are probably the most basic transformations that typically get done to many datasets. # same. Set them to 0. Our BasicTransformer estimator should be able to be used just like any other scikit-learn estimator. We can instantiate it and then transform our data. Our transformer can be part of a pipeline. 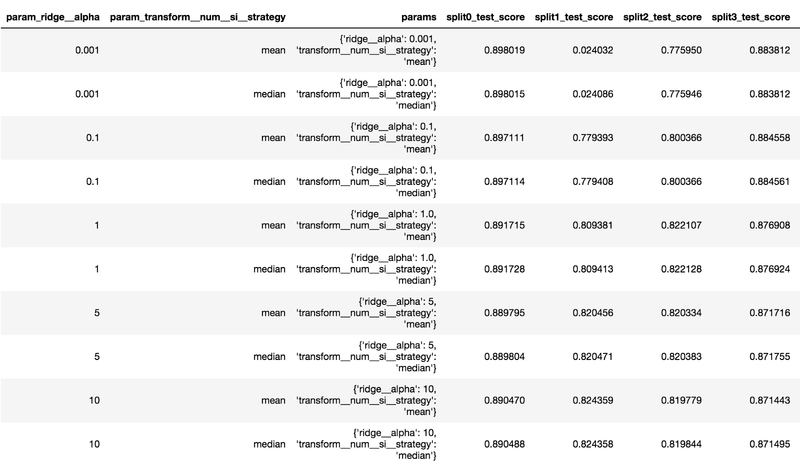 We can also cross-validate with it as well and get a similar score as we did with our scikit-learn column transformer pipeline from above. We can use it as part of a grid search as well. It turns out that not including low-count strings did not help this particular model, though it stands to reason it could in other models. The best score did improve a bit, perhaps due to using a slightly different encoding scheme. There are a few columns that contain years. It makes more sense to bin the values in these columns and treat them as categories. Scikit-Learn introduced the new estimator KBinsDiscretizer to do just this. It not only bins the values, but it encodes them as well. Before you could have done this manually with Pandas cut or qcut functions. Let’s see how it works with just the YearBuilt column. By default, each bin contains (approximately) an equal number of observations. Let’s sum up each column to verify this. This is the ‘quantile’ strategy. You can choose ‘uniform’ to make the bin edges equally spaced or ‘kmeans’ which uses K-means clustering to find the bin edges. We now have another subset of columns that need separate processing and we can do this with the ColumnTransformer. The following code adds one more step to our previous transformation. We also drop the Id column which was just identifying each row. We cross-validate and score and see that all this work yielded us no improvements. Using a different number of bins for each column might improve our results. Still, the KBinsDiscretizer makes it easy to bin numeric variables. There are more new features that come with the upcoming release. Check the What’s New section of the docs for more. There are a ton of changes. This article introduced a new workflow that will be available to Scikit-Learn users who rely on Pandas for the initial data exploration and preparation. A much smoother and feature-rich process for taking a Pandas DataFrame and transforming it so that it is ready for machine learning is now done through the new and improved estimatorsColumnTransformer, SimpleImputer, OneHotEncoder, and KBinsDiscretizer. I am very excited to see this new upgrade and am going to be integrating these new workflows immediately into my projects and teaching materials.